Your home is more than where you sleep at night. It is a physical extension of you and your family. When neighbors or relatives pull up to your house, the first thing they see is your landscape. Instead of trying to hide it, show it off! Adding light to certain aspects of your landscape increases curb appeal, heightens safety, and adds security. When you work together with an experienced landscape design company, they will be able to strategically place your landscape lighting to bring out the best of your home. At Groff Landscape Design, we know that choosing the right lighting for your landscape can be difficult to navigate between fixture styles and sizes and we are here to help. 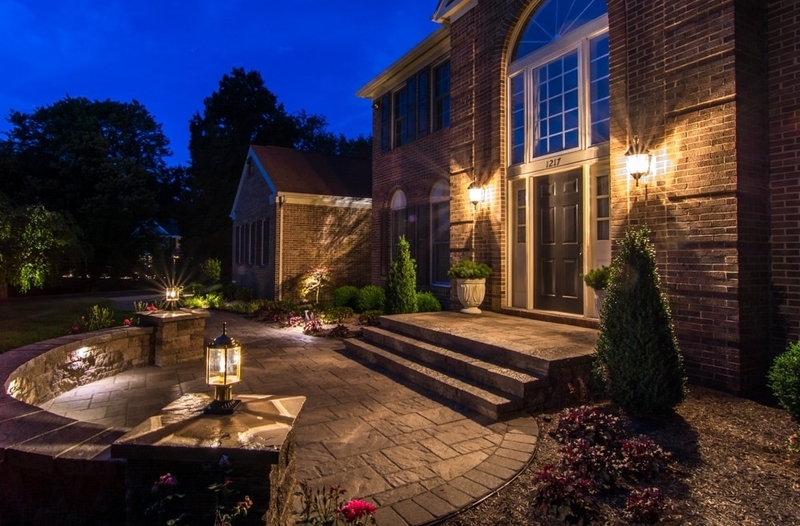 As certified landscape professionals, we are happy to have many valued customers desire professional landscape lighting in Clifton, VA. Due to popular demand, here are four ways landscape lighting can benefit different areas of your home. If your home’s main entryway is currently dark with poor lighting, this will make it difficult for you to enter your own home and identify people who visit you. Placing outdoor wall lights on either side of your front door will increase visibility and allow you to maintain your sense of security. With lights placed along your outdoor stairs and paths, this will make your home much more welcoming as it provides a higher standard of safety to your friends and family. Groff Landscape Design will help you choose light fixtures that will suit your aesthetic and isn’t too bright to make sure these paths are easier to see when it’s dark outside. Doing this allows visitors to know where they are walking without having to worry about taking their next step. Make your deck and patio more efficient and functional with lighting fixtures. As these areas are known to be places to socially gather and be merry, consider installing your lights near your patio furniture since this will prevent your family and friends from straining their eyes in the dark. You may also try and place your light fixtures at different heights to see which one will work best for your home. Outdoor post lights are perfect to place at both sides of your garage or driveway as these lights will increase security around your home. This will also allow you to see whether your garage is open or close before leaving or entering your own home. Consider light fixtures that have a timer so you can save more in the long run. At Groff Landscape Design, we are dedicated to providing the best possible customer service while delivering professional and quality landscape lighting services. Our certified professionals are expert craftsmen and will work with you in order to bring a smile to your face. With over 11 years of experience, you can trust our team to handle your project with the utmost care and provide lighting that will highlight your home’s unique features. We look forward to discussing your landscape lighting ideas! Contact us today at (703) 999-8225 to add value and comfort to your home with efficient landscape lighting.